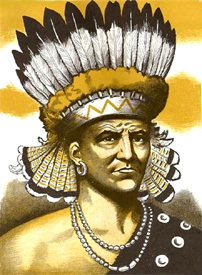 Despite the confusion over the precise meaning of Powhatan, the best-known Powhatan was the second paramount chieftain, otherwise known as Wa-Hun-Sen-A-Cawh, his personal name. Typically, though, even this name has several variations, including Wahunsonacock, Wahunsunacock, Wahunsenasawk, Wahunsenacawh, Wahunsenacock, or Wahunsenakah. Paramount chiefs gave their regional sub-rulers - weroances - the authority to handle hostile situations as they saw fit. This became clear to the settlers who recorded these details in 1607 and who experienced the hostility of the weroances. Like any ruler or sub-king, a weroance did not go out to meet a visitor - the visitor would be escorted into the presence of the weroance. They and their wives and councillors would often dress themselves in their finest jewels and tanned deer skin. George Percy wrote a vivid description of the Rappahannock weroance, whose body was painted crimson and face was painted blue, sprinkled with silver. He wore a red deer-hair crown tied around his hair knot and a copper plate on the other side, with two feathers arranged like horns, and earrings made of bird-claws fastened with yellow metal. When the weroance came to the shore of the Rappahannock River to meet the English colonists, he was playing a flute. 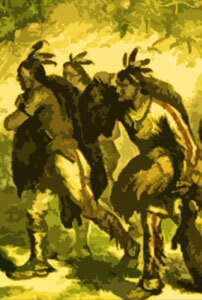 He escorted the explorers to his camp following a tobacco ceremony. There has been a good deal written about this group of Virginia Indians, often known as the Tidewater People. Various primary authorities include John Smith (1607) and William Strachey (1616), the principal sources here, as well as the Virginia census of 1669 and Robert Beverley (1705). A debt of gratitude is also due to James Mooney who, in 1907, drew all the strands of this fascinating history together in a first rate summary. From this summary it would appear that the Powhatan confederacy held around 21,000 square kilometres of territory (8,000 square miles) or, to put it another way, twenty per cent of the area of the modern state of Virginia. The native name for this part of Virginia was Tsenacommacah (Tsenacomacah), and Powhatan ruled his domain from his capital of Werowocomoco. His dominion commenced with just six original tribes which were soon supplemented by Powhatan's personal conquests. The Pamunkey outnumbered the other five put together, and it is thought that they were the initial nucleus of the confederacy. However, the initial six tribes only account for five hundred of the total 2,500 warriors under Powhatan's overlordship. Smith names twenty-eight tribes but indicates thirty-six 'Kings' Houses' or tribal capitals. The total number of villages within the confederacy was 161. A manuscript authority of 1622 agrees with Smith, indicating '32 Kingdomes'. Strachey in 1616 gives a list of thirty-two chief jurisdictions, many of which disagree with Smith's earlier list. However, he assigns two chiefs to the Appamattock, three to the Pamunkey, and four to the Nansemond. This reduces the number to twenty-six. The settlers were initially confused about the native names, and for some time they referred to the Quiyoughcohannock (or Quiockohannocks) to the south of the James River by the name of Tappahannocks. The census of 1669, following half a century of virtually constant warfare, identifies only eleven of Smith's original list, augmented by five differently-named others, probably brought about by shifting populations and new tribal combinations. The genesis of the Powhatan confederacy is roughly contemporaneous with that of the Iroquois league (circa 1570). Despite this, there was a very great difference between the two. The Iroquois league was founded on a federal basis of common interest, mutual respect, and assured security, whereas Powhatan was a despotic monarch who ruled his confederacy through conquest, fear, and implicit obedience. As a result, at his death, the confederacy virtually fell apart and was reduced to a seventh of its original strength within a single century, whereas the Iroquois league flourishes to this day. Of course, the political background was very different for the two. The Powhatans had to contend with the presence of increasing numbers of incoming settlers and were exposed to frequent conflicts with them and with neighbouring tribes. Perhaps Powhatan's despotic regime was the best form of government, given the circumstances. 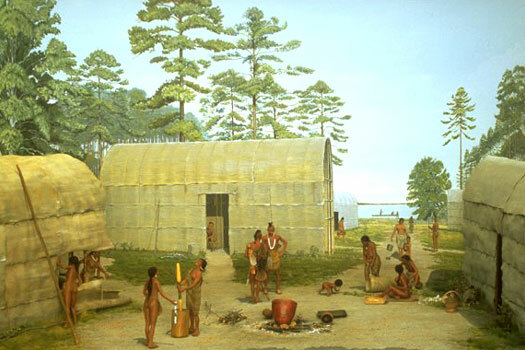 The Iroquois on the other hand were located further into the interior, so were better protected by the environment. Their tribal structure too seemed better able to cope with local hostilities. By 1705, when Beverley was writing, there were only six Powhatan settlements on the mainland and nine on the Eastern Shore, plus a few scattered remnants, the sum total coming to only 1,170 people (350 men). This state of affairs was the result of four Indian wars and an almost continuous state of hostility that existed between the colonists and the Indians, not to mention smallpox, epidemics, and general demoralisation, together with the total subjugation of a once-proud people. The confederacy had been completely crushed. Shown below is a table detailing the respective warrior strengths of the confederacy according to Smith (1607); Strachey (1616); the Virginia census (1669); and Beverley (1705). Shifting populations; renewed alliances, and new combinations of the broken remnants; the abandonment of old sites, and occupancy of new villages all play their part in accounting for the name discrepancies that recur throughout the history of the Virginia Indians. One is tempted to make a tentative suggestion here: where a tribal name ends on '-oc' such as Arrohatoc, Appamatoc, etc, it would seem that this is the name of the tribe. Where the name ends in '-ock' such as Arrohatock, Appamatock, etc, it seems to indicate the settlement name. Beverley (1705) gives figures only for the principal remnants but says all the Virginia Indians together don't amount to more than 500 fighting men - including the Nottoway and Meherrin (130 combined). This leaves about 380 for the Powhatans - including those on the Eastern Shore, with a grand total of between 1,150-1,200 men.